Burgums and Burghams of the "FF" family tree lived here, or nearby. TAYNTON ST LAWRENCE was endowed by Thomas Pury of the Grove, lord of the manor of Taynton and Minsterworth, and built after the original church was destroyed during the English Civil War in 1643. It was built during the Commonwealth in 1647 and a churchyard added. It is rectangular building of stone pointing north/south and consisted of a four-bay nave and a low square turret on the northern gable. The north porch was added in 1825, together with a gallery and a schoolroom. The church was restored in 1865 and 1870. A two-bay chancel and organ chamber were added in 1894. The church has a very particularly attractive font, rather like a goblet decorated with cherub heads. 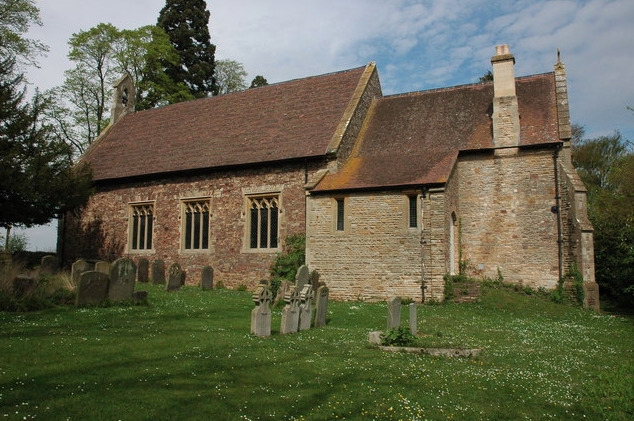 The list below shows the baptisms, marriages and burials that took place at Taynton, in Gloucestershire. (1) Rev. James Archibald was curate at Newent in 1830. (3) Rev. William Charles Holder was apparently a well-todo man, owning a large property in Taynton. In 1834 he moved to Cam, in the Cotswolds, and sold his Taynton property to pay for the erection of a large vicarage and a girls' school. However he died just three years later, age 37, "worn out with his arduous labours". (4) Rev. Edward Hawkins was born at Minsterworth in November 1800 He attended Pembroke College, Oxford receiving his degree in 1822. He was ordained as a priest in in 1824 and returned to Oxford in 1825 for his MA. He was curate at Churcham in from 1824 until 1837 when he went to Taynton. Later he was appointed perpetual curate of Coleford. In 1862 he was made canon of Lanndaff Cathedral and was vicar of St Woolos, Newport, for over 42 years until his retirement from Holy Orders in 1882. He died at the Hawthorns, Newport, age 96 in 1896.